We noticed that many of the lifters had well manicured hands except they liked growing the nail longer on the thumb – some more so than others. I took the opportunity and asked our new friend 85kg senior lifter Zhao Yongchao why this was so and this is what he had to say. According to Zhao Yongchao, there’s a callus that gets formed on the middle finger from the usage of the hook grip. This area on the middle finger is typically where the thumb will contact with the middle finger and create a lock so the barbell won’t rotate and fly out of your hands during the lift. By growing the thumb nail out, it’s like having a longer lever in which to lock against the callus. With this, you can have a stronger, firmer yet more relaxed grip on the bar. 1. He was a chubby kid and so his parents sent him to a sports school at the age of 12 to help him lose some weight. 2. Athletes that take home a gold medal at the Olympics get paid 4 million RMB (that’s a little over a half million USD). When asked, how much athletes get for silver and bronze, his answer was, “it doesn’t matter, I’m going to win gold.” He said this in the most humble manner possible. 3. During the Asian champs, he watched a 94kg Uzbek guy snatching 175kg. His technique didn’t look good (not the right power transfer position) but somehow he still managed to lift that weight up. 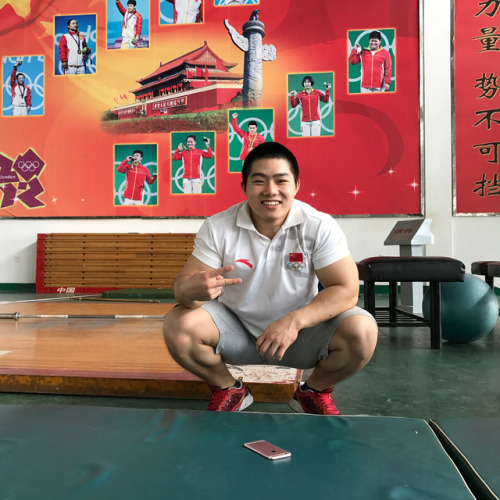 Then he suggested that China should sent their coaches abroad to learn more about their training methods in the higher weight classes because he felt that their technique is inferior to his but somehow they still can lift the weights up.